Hi Parents! You know you’re crazy right? We all know how crazy you are, but when did it become acceptable to live with crazy people? On any day at ANY school dropping off and picking up is messy, our PS 277 is no exception. For about a half hour every morning and every afternoon our arrival and dismissal times are a mess but you parents make it one million times worse. Many 277 parent drivers double park on BOTH SIDES of Gerritsen Avenue all the way down to Avenue X. You make crazy dangerous U-Turns, you basically drive any way you want to. Then if it rains or snows multiply everything by 100. You do these dangerous things, all the while kids are crossing everywhere and two lanes ofÂ traffic are moving in and out. I personally like when your kids run across two lanes of traffic to get inside a double parked car. 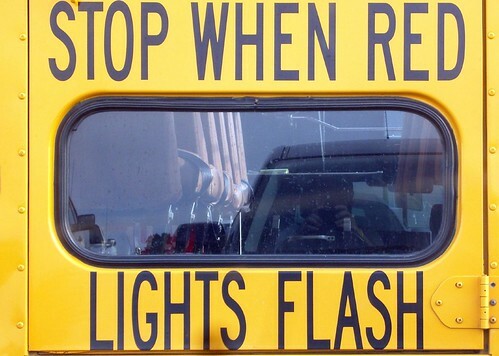 Since you don’t follow those rules of the road why would you follow that pesky law that says YOU HAVE TO STOP for flashing red lights on school buses on ALL sides. Maybe I need to become a parent so I can drive anyway I want to. Failing to stop for those pesky flashing red lights carries 5 points plus a fine. I am going to start to take pictures of each and every single one of you. You are allowed to park within that SOLID white line, but it’s really only supposed to be used for dropping off and picking up, YOU SHOULDN’T STAY PARKED THERE. Be warned. It’s amazing that you parents CRY for a traffic light on Channel Avenue when you can’t even stop for your own crossing guard. Hope to see you on this site soon. Boy, isn’t that the truth. Negotiating your way past 277 when school lets out is like dodging a mine field. Come on folks, my kids went to 277 and if I picked them up I would do something really crazy……I’d park my car in a legitimate spot and walk to school to meet them (yes, walked!). What really drives me crazy is the people who park on the bus stop forcing the kids who have to take the bus into the street to board. Come on, I know your kid is the most precious one in the world but you’re endangering the lives of the kids when you force them into the street. No wonder obesity is such a problem, when parents and kids can’t walk a couple of blocks to a parked car. Just plain lazy and inconsiderate. What time does scholl actually let out? This nut jobs start “parking” in front of school around 1:30 -1:45PM. I try to avoid the avenue during school hours but sometimes it just can’t be helped especially when you think its safe to drive down before 3pm only to be surprised by the 1 lane they leave open for traffic. I konw, I know, it has been stated here before that they are “allowed”to double park during this time. My kids actually walked to school and back. Most of the kids at 277 live in the beach and the exercize is good. As far as safety issues, children can walk in groups. Its not the kids, its the parents! God forbid their lovelies get a little rain on them, You could just buy the kid a raincoat its would be safer than letting them jump out & navigate thru the other triple parked cars & harried parents making uturns & just driving hazardously. OF PLAN TO DROP OFF PICK UP COULD BE DICUSSED AT A FUTURE MEETING. I don’t like you older people that type all in caps. I agree that its a problem but its only for a half hour a day so is it a problem? If a child gets hurt it will become a serious problem; the fact is it is illegal to double park like that. Its rude and inconsiderate; but what else do you expect from selfish, self-interested people. They only think of their own convenience.!!! YOUR WORRIED ABOUT CAPS! GET A LIFE THEIRS MORE TO WORRY ABOUT IN LIFE THEN THAT! I’m not an old person, and I don’t write in all caps. This is a problem, because someone is going to end up getting hurt. If you live in this neighborhood there is no reason why you should not walk your kids to School. It will literally take you no more then 10 minutes. when i wait to ps. 277 i would have to walk, if i ever ask my parents to drive up to school they would laugh at me for wanted a ride to school,,, the only time i got driven to school is if it was really down pouring…ps.277 these days is freaking crazy that’s why these kids these days are so freaking lazy…there is no reason why the kids that live down here can’t walk to school espically the kids that live in the new section…everyone complained about the speeding on there ave and now we have these stupied lines on the ave, but it okay for those same people that complained to double and triple park on the ave causing hazardous conditions on the ave for the kids and traffic trying to pass you people….we only have 1 lane now keep it clear for traffic your kids won’t die if they have to walk down or around the block.. It is about time that something is done about the double and triple parking in front of 277. Parents wise up now before something serious happens. To those of you who used to walk home, i am certainly not letting my 5 year old walk home on the avenue or any other street for that matter, and many of us parents are taking their kids to other activities outside the area or have to get to work immediately after dropping them in the morning and don’t have the time to walk to the school and then back home. I certainly will not defend the triple parking and u turns because they are definitely too dangerous, but as for double parking, the majority of us do it right at pick up and leave immediately after. of course there are some who get there way too early and there are some who just kinda hang around for whatever reason, but show me a school in new york city where that dosen’t happen. The majority of people complaining probably dont have young children or are reminescing from years ago . And if you pay attention to the area at dismissal time, you will notice that the meter maids have been creeping around right at those times to make their quotas, how fair is that? kinda like shooting fish in a barrel. As for taking pictures of the cars and their drivers, go right ahead, but make sure you walk there or park legally first. First of all, I wouldn’t let my 5 or 6 or even 7 year old walk to school alone in this day and age, so that accounts for a nice size portion of the cars, then you have parents that are off to work after the drop off and don’t have time to walk to the school and back, and then you have parents who are taking their kids to other activities right after school out of the neighborhood. I don’t think anyone expects a 5, 6 or 7 year old to walk home alone. But some mom’s & dad’s can walk them to & fro. the biggest proble is the people who camp out. They park from Cyrus Ave to Ave W They block the bus stops. they get there at 1:45 When did scholl start letting out that early? I thought scholl let out closer to 3PM. A few years back there was this one woman who spent the ENTIRE day in front of scholl drinking coffee & smoking cigarettes. I swear, she was there at 8AM, 11Am 1PM 3PM (I work various hours) whenever i drove by there she was. The thing with her though was she wasn’t in a car so who really cared if she had no life outside of her children to the point she had nothing to do while they were in school. Page 10 Daily News today, the city council to pass a bill for $100 fine for diling in front of a school for 1 minute. This is just another tax. Typical of the me, me, me attitudes of people today, if cops want to give out tickets just hang out in front of the school at the beggining and end of the school day, after a while it will stop. I drop my 5 year-old off at 277 every morning on my way to work. I come up Channel Ave. at 8am because I do NOT want to make a u-turn, and make a left onto Gerritsen Avenue and pull into a spot in front of the school (NOT in the crosswalk). As soon as the middle doors open, my child jumps out and runs into school. As soon as I see that he’s in, I immediately pull out (unless I have been blocked in by someone who is busy gabbing to another parent), go up to Bijou, and make a left (again, no u-turn). It boggles my mind the way people make u-turns, block the school bus, park in the intersection, etc…if everyone could just drop off and then immediately leave, driving legally, it wouldn’t be as bad as it is now. You said it. A lot of parents do that. I see them driving down Aster of Celeste around 8;30 or so. Its the parents who make dropping & picking up children a social event that are the problem. My children are now in high school and both attended PS 277. Me and my husband both had to leave for work 2 hours before school opened. They would be up, fed and ready for school before I left the house. They walked to school together everyday and all my neighbors were aware of the situation and kept an eye on them as they passed their homes 2x a day. This included on cold days, rainy days etc. Many children make it to and from school each day without being driven to the front door of the school. Children need to learn responsibility from a young age. Many parents have to work early and alot of people even here in GB either don’t drive or own a car so walking and public transportation are a part of everyday life. Every year this topic comes up – it was talked about a lot when they wanted to do the green streets. They have a meeting & it changes for a little while but always goes back to the triple parking & crazy u-turns. If you stop for a school bus, you get some parent with a car full of kids honking at you! No one expects to see 5 year olds walking to school by themselves. There is no reason why 4th & 5th graders cannot walk to school in groups. They wander the streets in the afternoons and all weekend so why can’t they wander themselves up to school? I have neighbors who don’t have jobs that will stand outside the school socializing with each other while the kids run around. Why not car pool? Take turns driving each other’s kids? Even if you don’t live on exactly the same block…they all have SUVs and minivans. Theres just no way you can have a child walk to school today, at least not one in elementary school. This AM I saw the mess of double and triple parked cars and notcied that just past the bus stop by Leos there was parking. It would take 2 minutes to walk to the front of the school from there. When I drop my 5 year old at school (not 277) I always park legally and we walk however far we have to. I explain to her that the people double parked are breaking the law and we dont break the law. It bothers me when anyone double parks, it creates a dangerous situation, and how you could be okay creating this dangerous situation near where you kid goes to school is beyond me. I don’t understand the “all the parents at the other schools do it” defense. Wouls you let your kids get away with reasoning? I love the new saying at the school but why didn’t anyone proof read it? The words should say “an exchange” not “a exchange”. No wonder our children don’t know how to write English properly! fields n walk him in the breakfast door because of the crazziness in the morning I make sure I m there early so I dont have deal with all the parents who let there children cross between the double parked cars with no regard, or they let them just run out of the car when they think it is safe. As far as dismissal that is another story parents r just lazy they get there early so they dont have to walk. I park at the park and walk after all a little fresh air never killed any one. I hope nothing happens to the children. OnAnOnAnOnAnOn great statement! anyone want the sidewalk in the middle of gerritsen ave? most of us hate the one lane on the ave, that’s going to be worse and it’s going to happen if this problem up at the school is fixed, then what will all you parents do? parents do have to drop there kids off and run to work and nobody does expect the younger kids to walk up to school them selfs, but that is no excuse for what’s going on by the school and one day one for those kids are going to get hit by one of those cars making a u-turn or just a car trying to get threw that mess and then what the person thats just driving by it going to hit a kid the runs into the street or gets hit for a person trying to go around a triple parked car is going to be a fault right? park on the side street, by the side of the park so what if you have to walk 20 feet to the school…i see alot of females up there gossiping away while there car is triple park, they think they can park anywhere they want( and some of these females i know and have passed comments about it, and there like whatever) it would be like christmas for a cop that has to write summones up there, and i think it’s getting to the point where some people are hoping that some of you do get the summones. I would reconsider taking pictures of the offenders. I think this practice can potentially put the children in more danger. Parents who feel that they will are being photographed can become confrontational or perhaps try to pull out hastily potentially hitting a child in an effort to avoid ending up on this site. Secondly it creates a witch hunt mentality, we need to work as a community to resolve issues. Out-ing our neighbors will just lead to infighting. We pay enough taxes to demand that the police department perform there jobs. We need to ensure that this becomes an ongoing measure and not allow them to blast people with tickets for a week and then act like its no longer an issue. Great point and I agree with you. I dont want a witch hunt or anyone to do something crazy because of me. I think I need some (one or two)photographic/video examples, its not like im going to be out there for a week. I think I just need 15 minutes. Unfortunately they will all be blasted with tickets, if they are parking and driving the way they are. Sounds like the logical solution is to get more kids to walk and bike to school. Was it a holiday today? Went by at 8:32 and no one was there. The area was deserted. Seem sparents can drop off quickly when they want. Great job! That’s because doors are closed by 8:15 AM. I have grown kids now and walked them to school. If we had to use the car because of bad weather we parked in one of the courts in legal spots and walked, seems the parents now are getting lazy. I am tired of trying to pass all the double parked cars in front of the school when I am trying to get to work on time. Besides the U turns being made in the middle of the blocks this is all a dangerous situation and I believe complaints to the 61 may be they only way to go now if enough of us make them MAYBE we will see results and hopefully a police officer there in the morning to make the cars move and not park in front of the school! Listen to all of you Bs’ing. Enough already. There is nothing that can be done. How many legal spots are in front of the school? Exactly NONE. No parking anywhere. There are 450 students in the school. You do the math, if you’re smart enough. Oh by the way, we have convicted pedofiles living in our neighborhood. Right here in good old Gerritsen Beach. So I’ll ask you, do you want your beautiful pre-teen to walk to school by herself or walk home knowing that this shiX lives in our neighborhood? Do you leave yourself 20 minutes to walk to school everyday? Rain, Snow, Sleep, freezing temps?? Come on, these children are being pushed hard enough, do we now have to get them up at 6? You’ll see it change a bit in the nice weather. Unless a parking lot if built, this is what we have. My suggestion to you brain surgeons, if you have no children, don’t go by PS277 at the drop off and pick up times. Go through the blocks. Yes, this will work. Yes triple parking is a no no, don’t do it. Hey, let’s focus on all the pieces of shixxx that live down here and keep breaking the bus shelters, and doing other bad things. Give me a break. This sort of craziness goes on in front of every school in the city. There are signs saying that the area around the building is a school zone, which means slow down because anything can happen. If you choose to take the Avenue to get where you’re going at arrival or dismissal, then take a chill pill and thank God you’re alive. There are more important issues to riled up about. Its a group on facebook that also has this as its pet peeve.